Kevin McPherson, center, is honored by Rolla Fire Chief Ron Smith, left, and S&T Police Chief Doug Roberts for saving a fellow student from drowning. McPherson was surprised with the recognition during a Student Council meeting at the Havener Center Nov. 27. 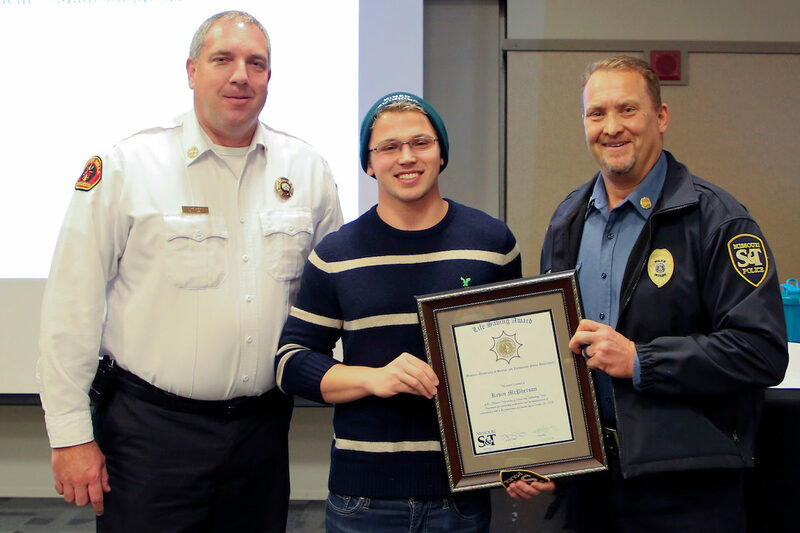 On Oct. 30, McPherson, a senior in electrical engineering from Oakdale, Minnesota, and a member of the S&T swimming team, pulled a student from the pool at the Gale Bullman Building and performed CPR until she regained consciousness. Roberts says McPherson saved the woman’s life, and he wanted to recognize McPherson’s good deed.